How To Add YouTube Subscribe Button To WordPress Website? Every now and then, you would hear about YouTube and its videos. Nowadays, people are showing their talent through the visual content. Most of the website owners show the subscribe button to their website. Do you want to do that? Do you know how to add YouTube subscribe button to WordPress website? Everyone wants to get more likes and more subscribers and you can increase the chances by adding it to your website. It would increase the engagement of your website readers to your channel. 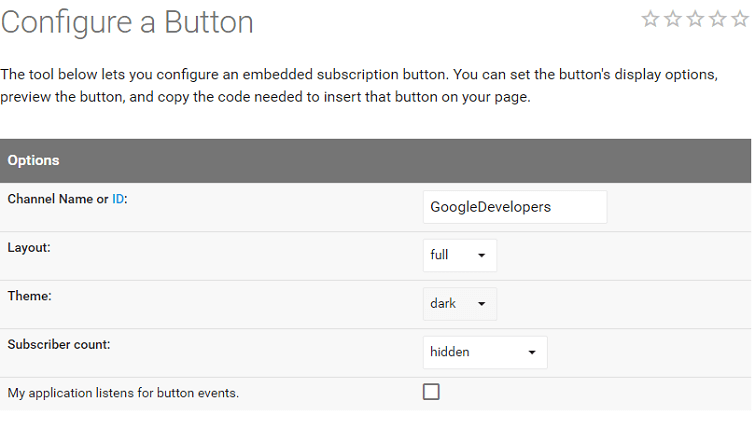 Generate The Code To Add YouTube Subscribe Button To WordPress. Just like Facebook like button, share button, Twitter follow button, LinkedIn button, you can generate the code for your YouTube channel. You will learn about the button and its customization. Yes, YouTube provides you some options to customize the subscribe button of your channel. Follow the step by step guide. Step 1:- First of all, visit the official YouTube button generator page. Step 2:- You will see a few options in which you have to include the name of your channel. If you know the channel ID then you can also use that. Step 3:- There are some customization options related to the theme and the subscribers’ count. The choice is yours whether you want the dark theme or the simple one. If you want to have a button of the full width then just select “full” from the layout option. You will see the preview of the button. Copy the code generated by YouTube. Step 4:- If you want to show it in the sidebar then use the widgets area. It’s on you. You can paste that code anywhere to your website. You Can Manually Customize the Button. As you have noticed that there a few options in the code. You can customize the appearance of the button manually. After pasting the code, you would see a nice subscription button to your website. Isn’t Easy To Add YouTube Subscription Button to WordPress? You just saw the manual method to add the button. If you are afraid to break anything then you can use the plugin. Which will provide the option to add the channel’s name. But it’s always recommended to use the minimum number of plugins. So it would be great if you use the official code to add YouTube subscribe button to WordPress website. How To Stop WordPress From Creating Multiple Images? Love to have one of this tutorials and haven’t started to get in touch with YouTube at all, but it’s definitely great to know about this. Thanks for that tip. I haven’t done many videos myself, but it’s good to know how to do this in case I start to add more. I especially like that you explain how to do it without a plugin. I already have too many plugins! The best thing is to not use any plugin for a task. Most of the people install numerous of plugins and make their website slow. You shouldn’t that. Add your subscribe button using the official code of YouTube. That is very simple but effective and I would like to congratulate for this great effort. Thanks a lot for sharing this content to me. I am also a blogger, I used to do only on the WordPress where its easy for me to do all the things, But for a long time, I was thinking about this youtube subscription. But I didn’t get any perfect material or guidelines for it. Then I got your post it was quite enough for me to go on with. I would surely use this in my post. Does only minimum number of plugins can be added to WordPress??? If you want to start your YouTube channel then it would be good for you to build the list. Use your blog to get more subscribers. For a WordPress blog, the best thing is to use minimum number of plugins you can. If you can do that without plugin then no need to increase the number. It will help you to maintain the speed of your website. One of the easiest way to grow our social media follower is by placing the subscription option on our blog. If we have a decent traffic blog, subscribe buttons for different social networking sites, will make it easier for our readers to follow. YouTube is undoubtedly the best video site that lets we can make money out of our videos And the only way to make more is to have more people watch our videos. YouTube has just made it easy to attract more subscribers for our YouTube channel with the one click YouTube button. We can add the YouTube subscribe button on our website using a small piece of code from the official YouTube subscribe button page. The YouTube Subscribe plugin that makes it easy to add YouTube subscribe button to WordPress sites. Eventually, thanks for exploring much interesting facts regarding subject. No doubt that YouTube is one the biggest site to share your videos. People are making living from YouTue. You can use the traffic of your blog to get more subscribers to your YouTube channel. YouTube provides the code to generate the subscribe button. You just have to use that code anywhere to your website. Most of the people prefer the sidebar.